Busses packed. Pillows firmly on laps. Lollies stashed away in bags. Laughter filling the aisles. Do you remember your first school camp? Westside Christian College continued its long history of outdoor education with a series of camps in Term 3. From Moogerah to Burleigh, students in years 7, 8. 9 and 11 enjoyed getting to know each other, test their limits and discover what it means to be a leader at Westside. Students on Yr 7 Camp bonding at the beach. 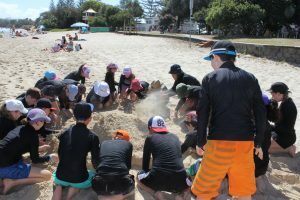 Year 9 students undertook a wide range of outdoor educational activities on their camp. The goal for the cohort was to find strength and recognise the value of determination. They challenged themselves with high ropes, pole climbs, hiking and camping out under the stars. Preparing food, fending off the rain and encouraging one-another to conquer fears were all par for the course. Mrs Rachel Cramer reflected “It was special to see adversity draw the students together. They cheered when someone jumped from the pole or took that first step onto the wire. They really grew as a grade.” Another student gleamed “I did not want to put on that harness! But I knew I was there for a reason. So I did it. I felt really supported”. Parents, students and friends can keep up with live updates from our camps by following Westside Christian College on Facebook.